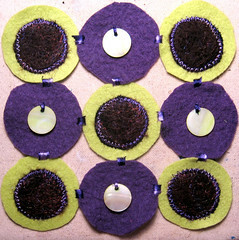 5 felt circles from a gift bag, 4 felt circles from a piece of felted wool jersey (it is purpler than it looks – I'm having color troubles) some black embellished circles and 4 acid green mother of pearl dangles. ETA (Edited to add) the circles are about 2", so the whole object is roughly six inches on a side. The connections are satin stitch on the sewing machine with my (new! gorgeous!) purple variegated thread. kinda circular nine-patchy, yes. how big is the whole piece? Are they joined with ribbon?